The Rambo-Tschambo-Ohrwurm Band consists of one man - one man who simultaneously plays the drums, cymbals, tambourine, banjo, horns, bells AND sings! Hans Möckel and his one man band have been entertaining people all over Europe for over twenty years. Hans is a singer/songwriter who originally sang and played his guitar in bars and clubs in southern germany. 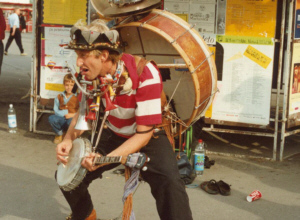 Slowly the Rambo-Tschambo-Ohrwurm Band (German spelling for Mumbo-Jumbo-Banjo-Band) began to develop and before he knew it, his full efforts had changed over from performing in clubs to performing on the street. Adults and children alike delight in Hans' performances as he plays and sings. His energy is contagious and surprising as he somehow manages to jump, dance and spring carrying 15 Kg of musical instruments on bis back, all the while performing for the crowd. His performance is very interactive with the crowd, especially with the children. The kids love him and he plays off their energy and fascination. Hans plays year round, mostly in the pedestrian areas of southern germany but also at festivals all over Europe and at parties.